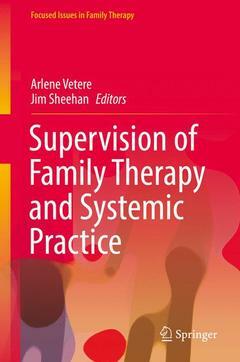 This much-needed volume examines the process and practice of supervision in family therapy, with special emphasis on systemic practice. Expert trainers and supervisors from diverse disciplines take a systemic tour of the relationships between supervisor, therapist, and client, analyzing the core skills of effective, meaningful supervision?including questioning, listening, and reflecting?and their impact on therapy. These skills and others are applied to supervising therapy with individuals, couples, and families in areas including substance abuse, domestic violence, and research settings. Throughout the book, contributors share self-care strategies, so supervisors can stay engaged and creative, meet the many challenges entailed in their work, and avoid burnout. The supervisor?s power and moments of learning. Beginning the Supervisory Relationship within Family Therapy Training: Engaging Individuals, Groups, and Settings.- Starting Supervision.- Asking Questions in Supervision.- Listening and Silence in Supervision.- The Resonance from Personal Life in Family Therapy Supervision.- The Reflecting Team Approach: Different Uses in Live Supervision and Group Supervision with Both Family Therapy Trainees and Practitioners.- Creating a Dialogical Culture for Supervision.- The Supervisor’s Power and Moments of Learning.- Supervision and Domestic Violence: Therapy with Individuals, Couples and Families.- Systemic Supervision with Groups in Child Protection Contexts.- An Approach to Supervision Practice with Therapists who Work with Pregnant Substance Abusing Women in Voluntary and Compulsory Treatment Settings.- Group Supervision with Couple Therapists Located in Rural Areas in Norway: Exploring Memories, Bodily Sensations, and the Richness of a Non-Linear Language.- Research Supervision.- An Attachment Narrative Approach to Systemically Informed Supervision Practice.- When the Supervision Process Falters and Breaks Down: Pathways to Repair.- The Supervision of Supervision: A Thematic Analysis of Family Therapy Supervisors’ Experiences of a Group Supervision Structure in a Training Context. Arlene Vetere, PhD, is a Professor of Family Therapy and Systemic Practice at Diakonhjemmet University College, Oslo, Norway, Visiting Professor of Clinical Psychology at Universita degli Studi, Bergamo, Italy and Affiliate Professor of Family Atudies at the University of Malta. She is a practicing clinical psychologist, systemic family psychotherapist, and family therapy supervisor and trainer. She has published 9 books, 48 peer reviewed journal articles, and 20 book chapters. She has recently co-edited with Peter Stratton (2016) ‘Interacting Selves: Systemic concepts and solutions for personal and professional development in counselling and psychotherapy’, Routledge, (to which, Per Jensen, Jim Sheehan and Anne Hedvig Vedeler contributed chapters). Arlene was president of EFTA (European Family Therapy Association) from 2004-2010. Jim Sheehan, PhD, is Professor of Family Therapy and Systemic Practice at Diakonhjemmet University College, Oslo, Norway. He has been Director of Family Therapy Training at the Mater Misericordiae University Hospital, Dublin, Ireland for 25 years from 1987 to 2012. Over the last 30 years he has supervised family therapists at all levels of qualifying training and post qualification experience. His research and publications in the area include a study of mature trainee’s experiences of learning within qualifying family therapy training as well as a consideration of the way supervision dialogues contribute to the ongoing personal and professional development of family therapy supervisors.